(Phys.org) —As participation in space exploration grows worldwide, so does the impact of orbital debris—man-made "space junk" that poses significant hazards to live spacecraft and astronauts should they cross paths and collide. Barry Coyle and Paul Stysley, laser researchers at NASA's Goddard Space Flight Center in Greenbelt, Maryland, want to develop a method to define and track orbital debris using laser ranging—a promising approach that could overcome shortfalls with passive optical and radar techniques, which debris trackers use today to locate and track dead satellites, spacecraft components, and other remnants orbiting in low-Earth or geosynchronous orbits where most space assets reside. 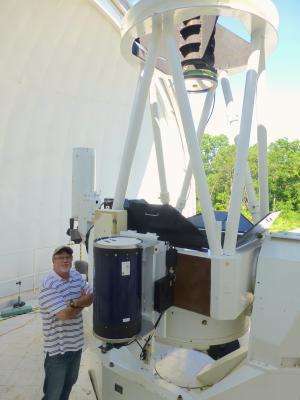 Inspired by an Australian study that found laser tracking increased the accuracy of debris ranging by a factor of 10 when compared with other methods, Coyle and Stysley now "want to reproduce the results from this paper on a larger scale," using Goddard's Geophysical and Astronomical Observatory (GGAO). The GGAO satellite laser-ranging team, led by Goddard's Jan McGarry, has advanced laser-ranging techniques using satellites equipped with retro-reflectors, becoming world leaders in the field. GGAO's 48-inch telescope, which transmits outgoing and receives incoming laser beams, was built in the early 1970s as a research and development and testing facility for laser ranging, lidar, and astronomical instruments. The facility has ranged to spacecraft at planetary distances and has been used to provide on-orbit calibration of some of Goddard's altimetry spacecraft. NASA also used the facility in 2005 to determine the performance of the laser-altimeter instrument aboard its MESSENGER spacecraft as it flew past Earth during its sojourn to Mercury. Once the team demonstrates ranging with a target not equipped with the retro-reflector, it would like to implement the technique in a global network of ground-based laser observatories to observe and more accurately track debris, thus aiding the world's current debris-tracking efforts. "Orbital debris is an international problem, the responsibility of all who can launch satellites," Coyle said. Although it's difficult removing the material itself, NASA mission operators can minimize its impact on operational space assets. They can move non-operational spacecraft to less populated orbits to remove the threat to new missions or allow dead craft to re-enter the atmosphere, where they burn up upon entry. What's essential is that these assets are tracked and monitored to protect active and future missions from potentially harmful collisions, Coyle said. In 2012, for example, the Fermi Space Telescope was on track to cross paths with Cosmos 1805, a defunct satellite. The Fermi team fired the spacecraft's thrusters for one second to alter Fermi's path. Each avoidance maneuver, however, takes time away from a satellite's regular mission and can be costly due to the need to carry additional fuel just to carry out these maneuvers. In addition, the International Space Station has performed 15 collision-avoidance maneuvers over its mission life, and more are expected. Given the need, Coyle and Stysley believe it's time to evaluate new, potentially more effective tracking methods. Optical telescopes, for example, can track sunlit debris, but they provide little information about the altitude of the debris. Furthermore, optical-based calculations are limited to sunset and sunrise, when the sun illuminates the object against a dark sky. Radar, meanwhile, provides a range, rather than the precise location of the orbital debris. Instantaneous positioning is typically accurate to hundreds of meters. Due to drag from solar winds and particles, the orbit changes, meaning that its predicted location will grow quickly by kilometers. With laser ranging, however, NASA could glean more data, including debris shape, size, orbital projection, and range. It also could track softball-size objects to an accuracy of a meter, depending on the object's shape and size. To show the effectiveness of laser tracking, the team plans to update the GGAO laser from its current 1.064 microns to 1.57-microns, making it safe to project large amounts of energy into the atmosphere without violating aircraft eye-safety standards. They would shine the laser light into the sky to find the debris and use the returned light to help estimate a trajectory and find a possible range for movement. With each pass, the added data would increase accuracy. "Orbital debris affects everybody," said Coyle. "Goddard was the birthplace of satellite laser ranging, and manages a world-wide network of ground stations for geophysical applications. We want new technology to flow through Goddard and a possible new network, as well."